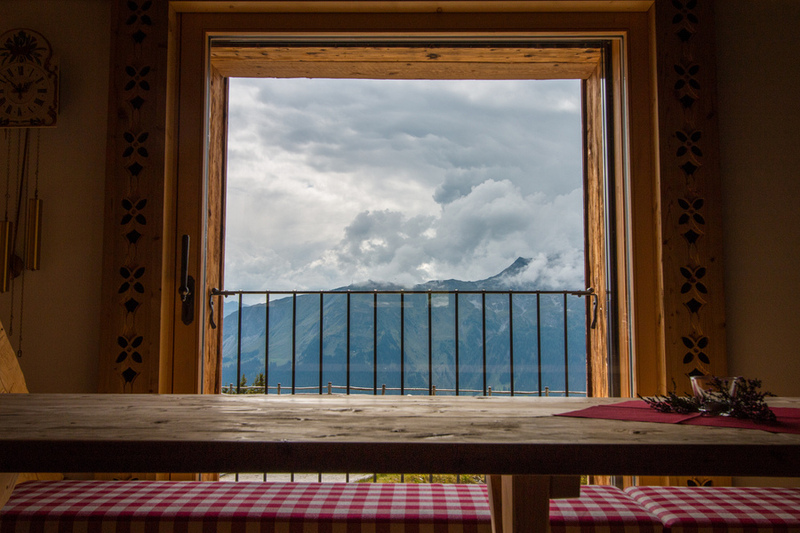 Home » Destinations » Switzerland » We Did WHAT in Davos-Klosters in Just 1 Day?! Our arrival into Davos was dampened by hard rain that even drenched through our rain jackets. We retreated to our hotel for the afternoon and evening. So when the sun indecisively shone through the clouds the next day we decided to make the most of the weather and fit in everything we had planned to do across the two days. 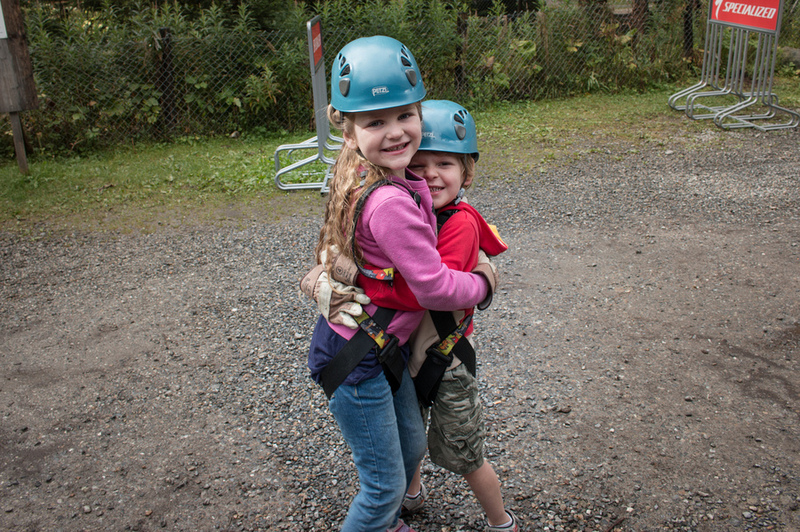 Just how much adventure can a family fit in one day? Let’s find out! 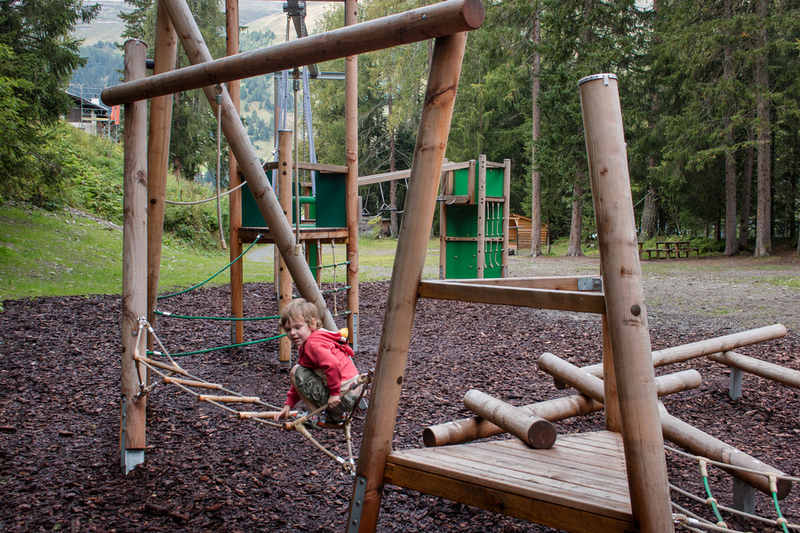 Not far from our hotel was the Adventure Park in Davos. We had visited the previous night to enjoy a delightful dinner at the restaurant, Chalet Velo, but now we were back for some serious fun. I offered to be the photographer while Josh and the kids suited up. 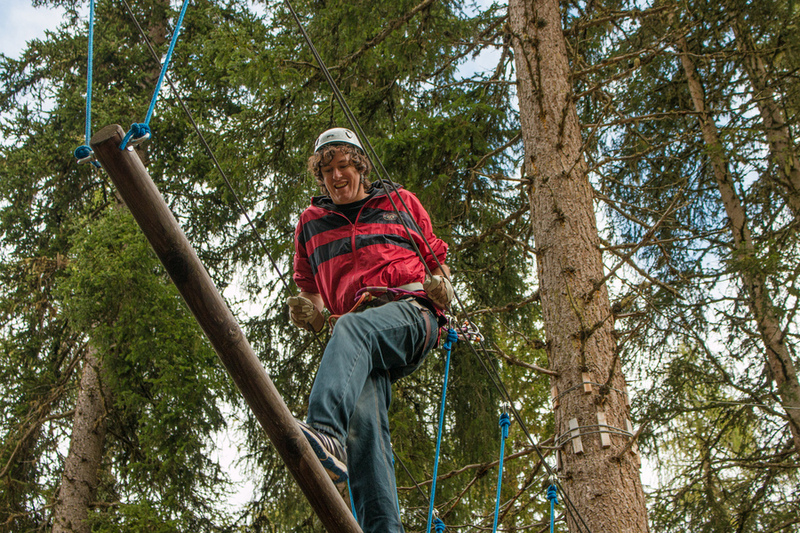 The Adventure Park offers 5 unique rope courses with varying levels of difficulty. The kids and Josh strapped on helmets, slipped on gloves and jumped into harnesses (if harnesses are something that can be jumped into). 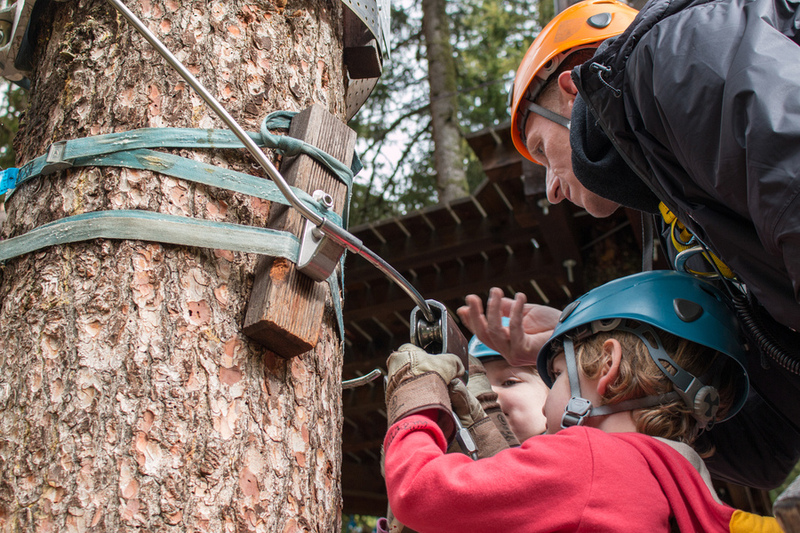 The children’s low ropes course, for 4 to 8 year-olds, was equipped with a fall-back system just for that extra peace of mind. Mia (at 5 and a half) was a pro whizzing through the obstacle course like she had done it a hundred times. Her favourite station was at the end where she was able to use her harness as a flying fox from a platform to the ground below. Caius (at 4) found the course a little more challenging. He managed to complete it two times before deciding he had had enough and bolted for the playground nearby. Mia kept on going and going, finding a little friend to continue racing with. Josh finally decided to climb up. He left the hardest “black” course for another day and opted for the “yellow” intermediate course. Using his height as an advantage he powered through using muscles he didn’t even know he had. 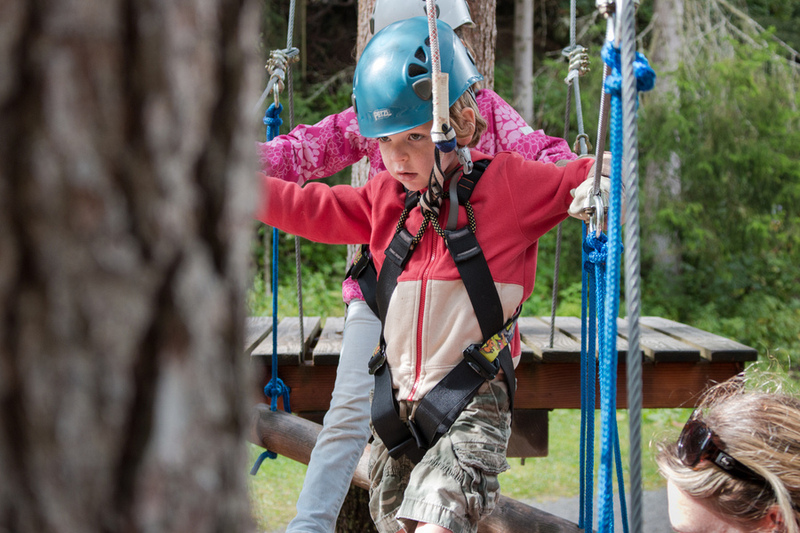 The high rope courses are a lot of fun and the various course difficulties means anyone can try it, regardless of their fitness level. 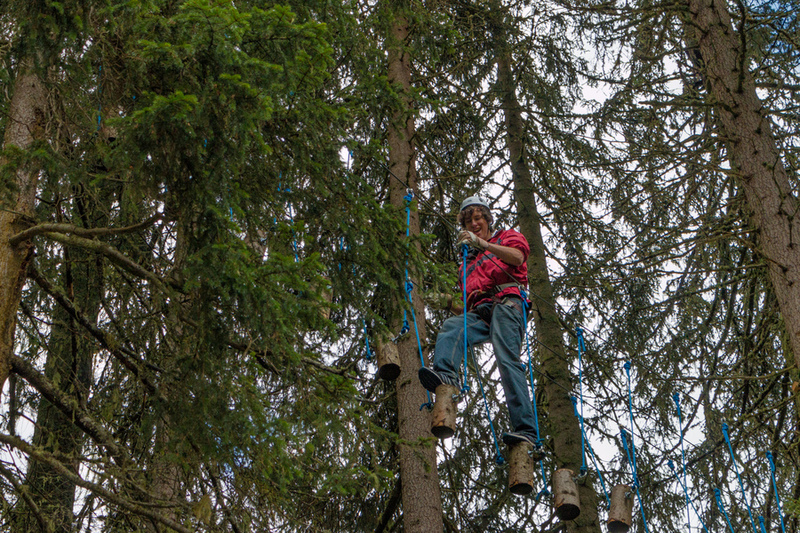 The rope courses are not the only thing you can find on the grounds. If you bring your own bike you can head to the bike park free of charge. 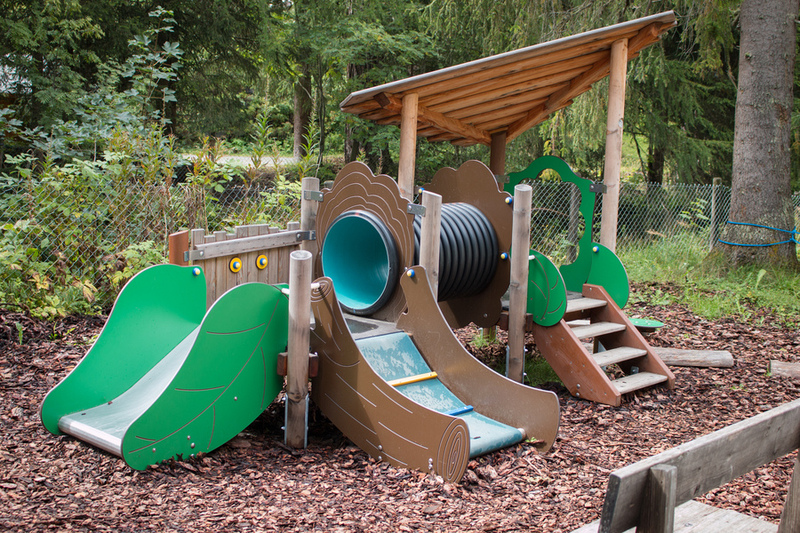 There is also a public BBQ area and two playgrounds. 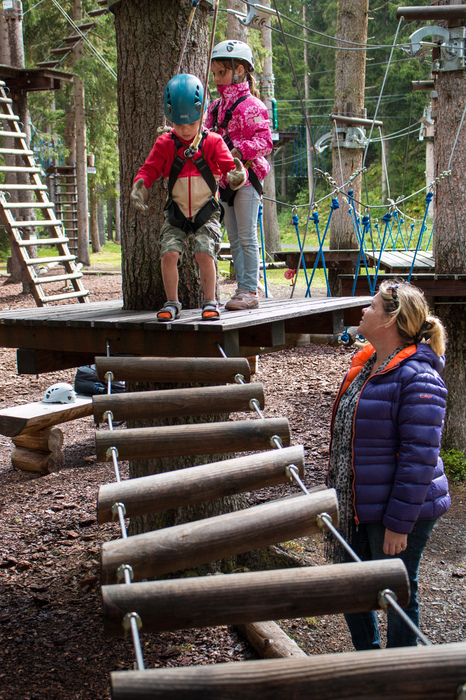 We loved this place for the children’s rope course and it’s delicious restaurant. 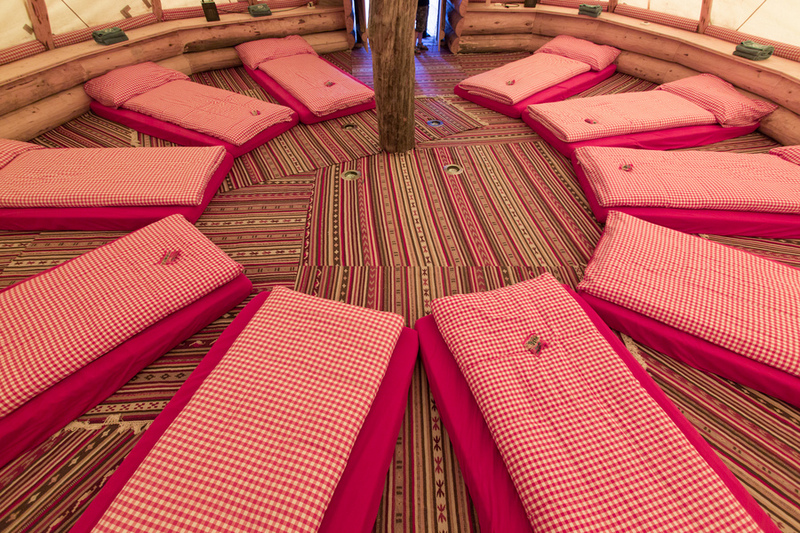 A great way to spend a few hours rain or shine while in Davos. 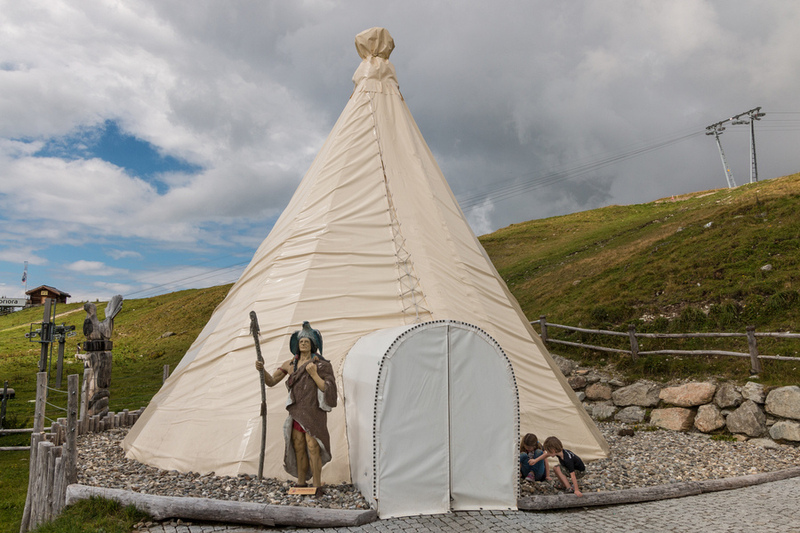 The Schatzalp is known as the “Magic Mountain”. What is the magic? 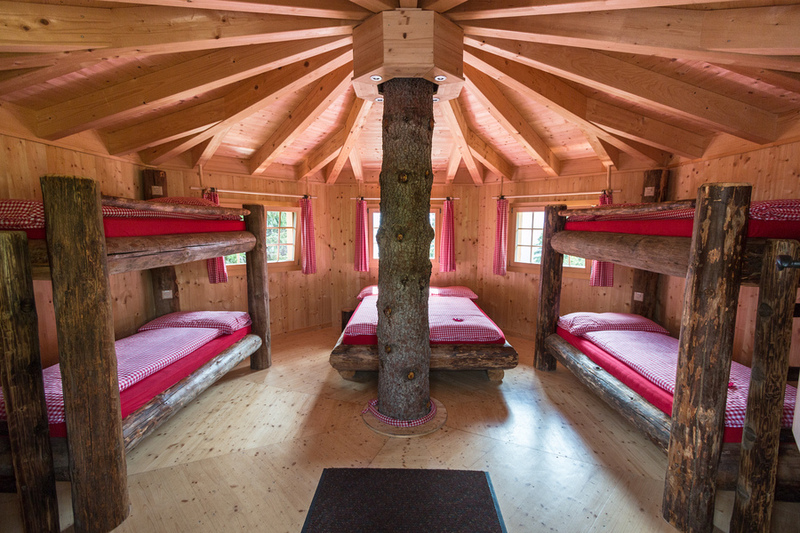 The magic started back in the 1800’s when a hotel was built in an Art Nouveau style, situated 300 metres above Davos with the most enchanting views. 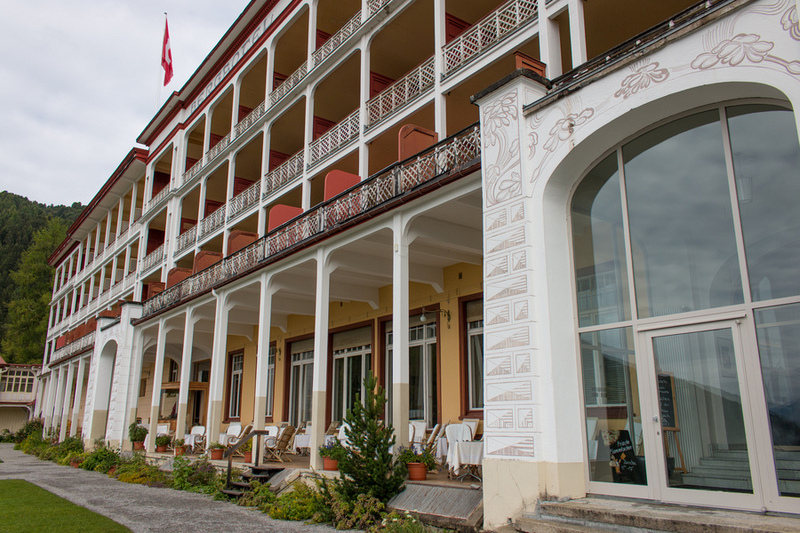 The hotel was originally designed as a luxurious sanatorium and was regarded as one of the most advanced healing centres of its kind during the 20th century. 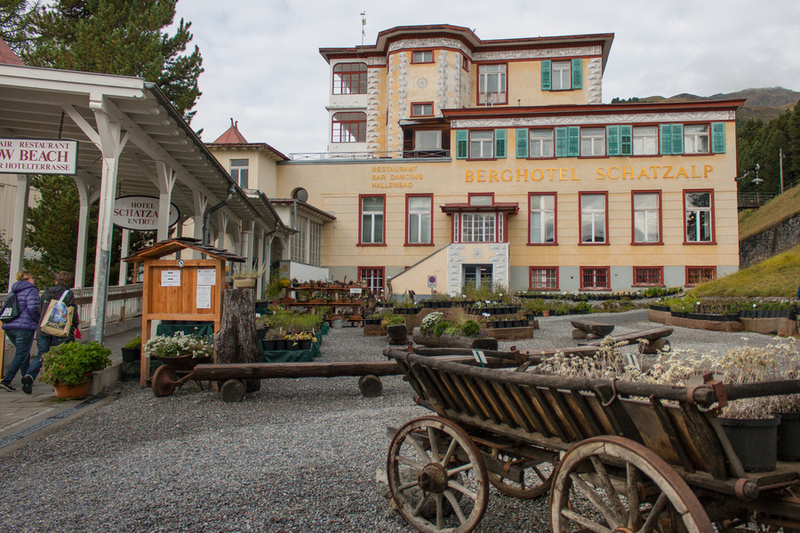 People came from all over the world to sit, relax and heal in the clean Swiss mountain air before modern medicine influenced the sanatorium’s rebirth as a luxury hotel. 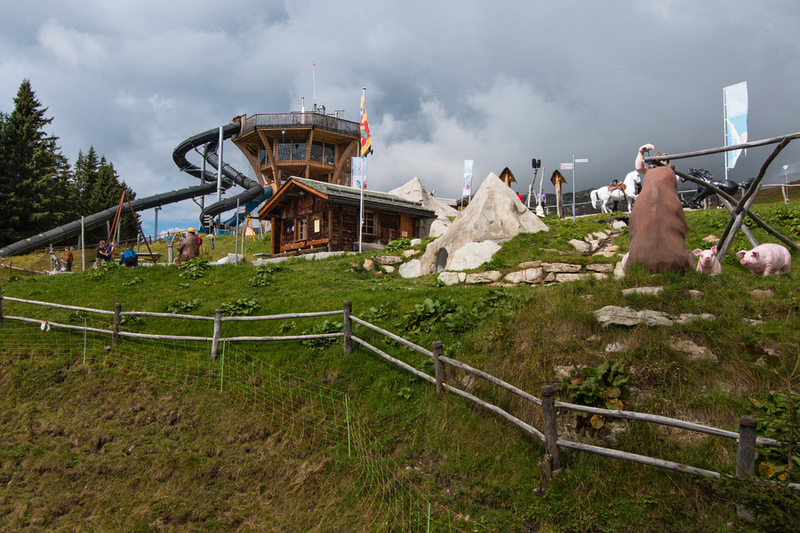 Even more famous than the hotel is the entire mountain which was immortalised in a popular novel, “The Magic Mountain” by Thomas Mann. 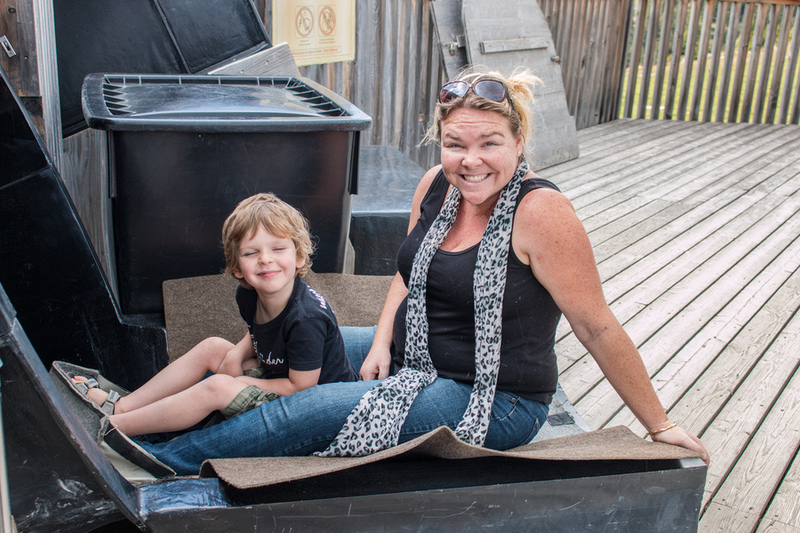 For us we found the “magic” on the summer toboggan run. 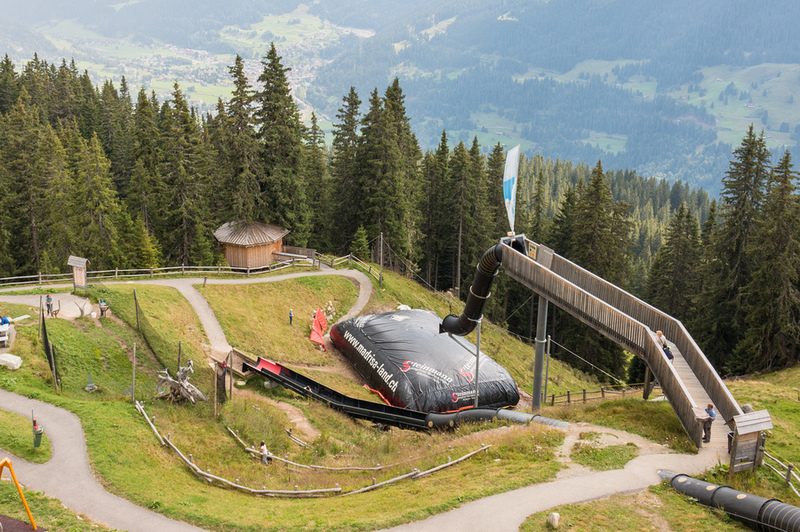 A 500-metre long steel slide that not only gave a thrill ride down the mountain, but conveniently took us up as well. Perfect! We had about 4 or 5 rides and the kids wanted to go again and again. Highly recommend a few hours on the Magic Mountain. Snuggle in tight, we're going to fly down the mountain on a sledge! Pffft! The slide at Google's HQ doesn't have anything on this one! 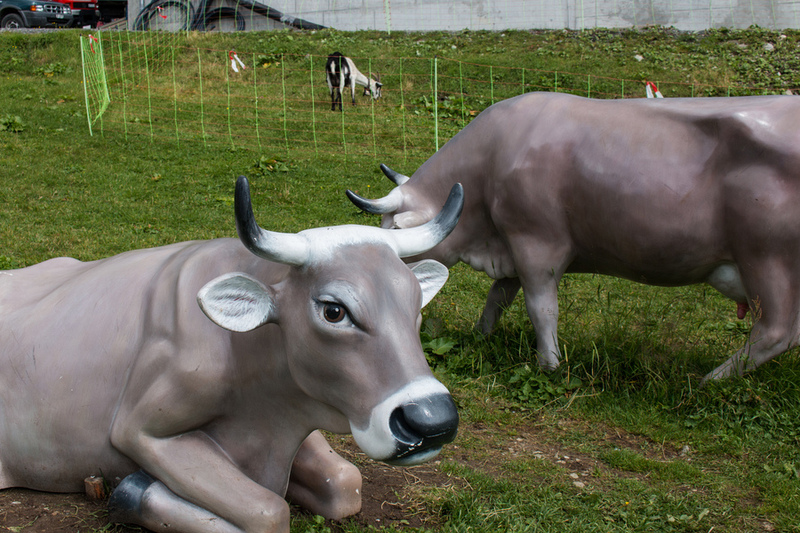 It can be easily accessed from the centre of Davos via a funicular which runs throughout the day. Our last stop on our day of adventure was in Klosters. 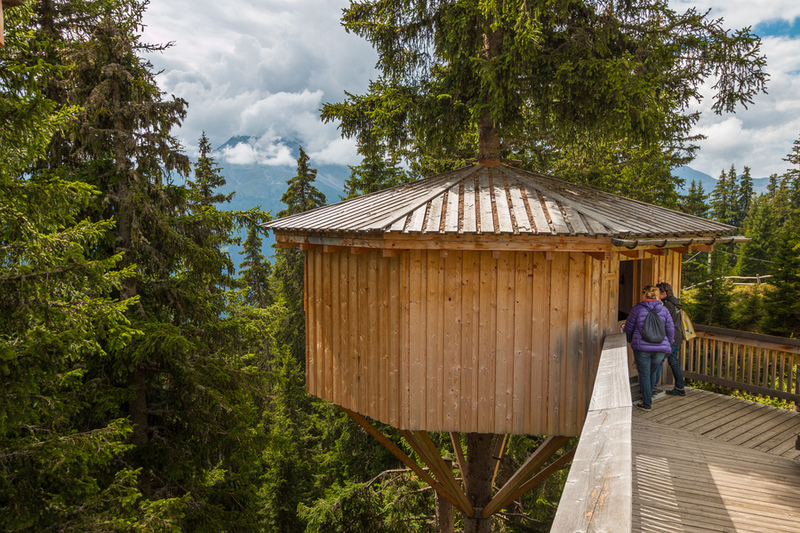 It’s a 19-minute drive northeast from the centre of Davos. This gorgeous alpine town receives British royalty on a regular basis as their preferred skiing destination. 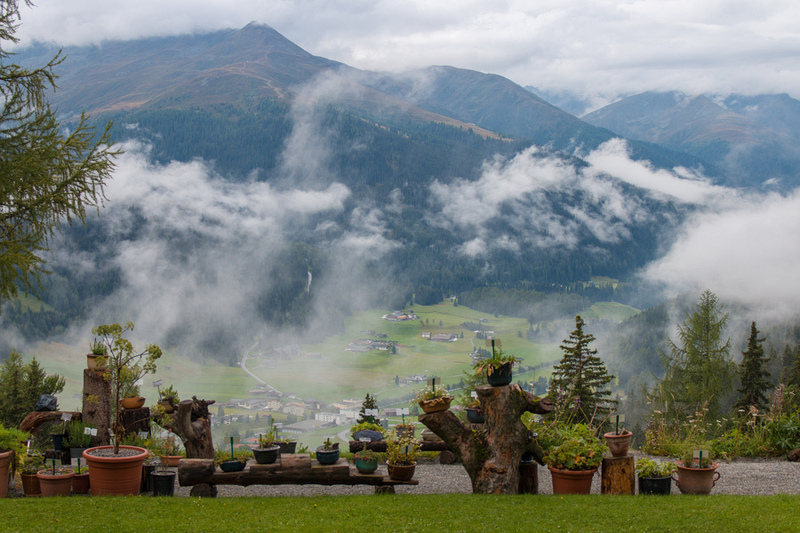 Madrisa is a mountain in the Rätikon mountain range, overlooking the town of Klosters. Its summit (2,826 metres) is located near the Austrian border. We took the gondola (not to be confused with a cable car or chair lift) to the top of the mountain and exited into Madrisa Land. Higher, higher, higher above the town of Klosters. Madrisa Land is many things, in summer or winter. During winter most of the activities revolve around snow, but being summer we were able to experience a whole lot more. 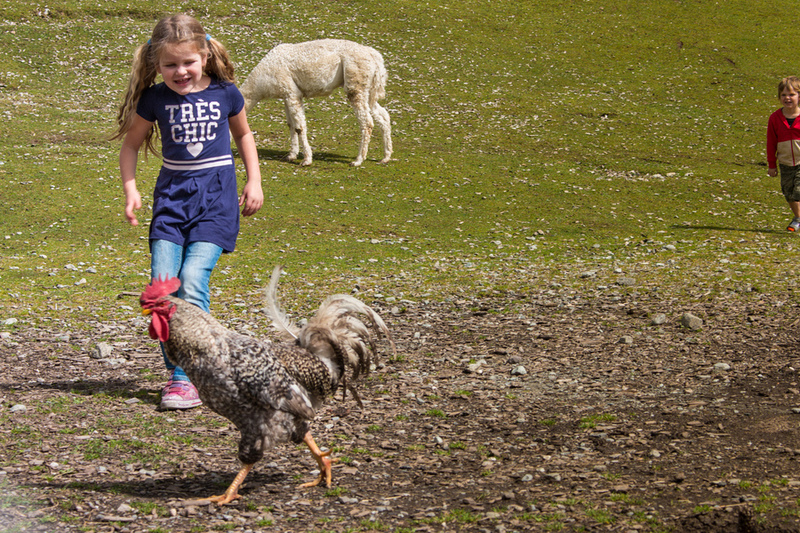 First stop was petting the goats and chasing the chickens in the petting zoo. There were rivers to explore with various water games, a jumping castle to bounce on, pretend horses to ride and also ambitiously large slides to zip down. 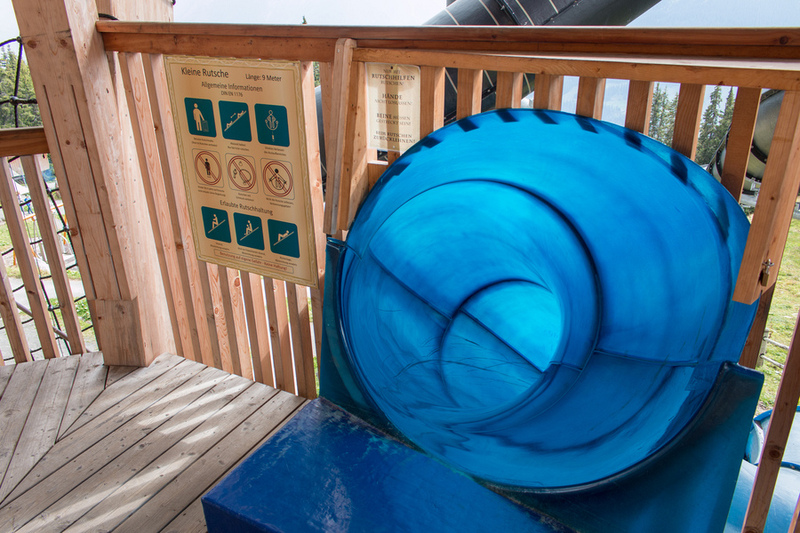 A little note of caution is needed for the slippery slides since there were no staff around to translate the German signage for us. Caius and I accidentally took a ride with a mat down one particularly steep slide, which in hindsight was clearly meant to be mat-less. It resulted in a couple minor friction burns and grazes, and a tumble which induced a tearful outcome for Caius. Before attacking the next slide we cleverly watched someone else go first before copying and enjoying that ride much more. We were considering trying the scariest slide, which abruptly ended several metres above the ground casting riders into a large inflatable cushion, when the rain started pouring down persuading us to find shelter in a little hut. 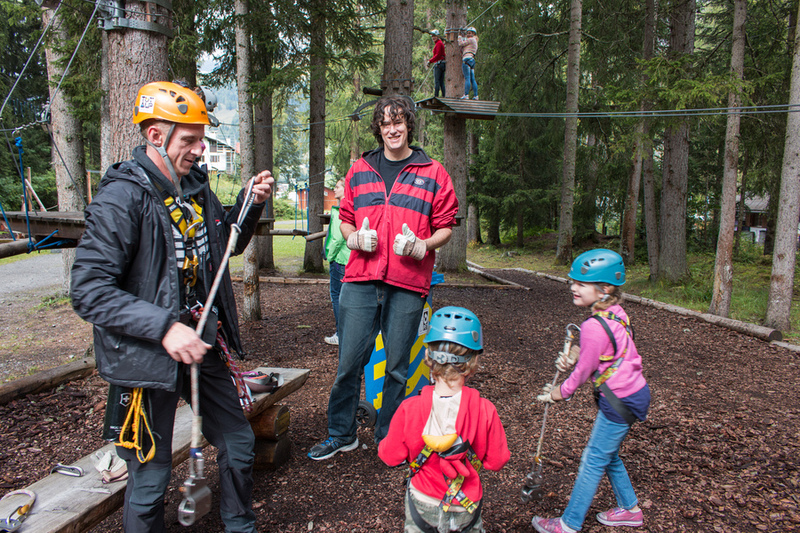 Other activities to try are the archery course or the downhill scooter trail (much like our LenziBike experience). We also checked out the little Tree huts and Indian Tepee that you can rent out for a night for unique holiday lodging. But book in advance, these places are usually booked solid. We enjoyed a delightful lunch at Madrisahof which was located at the top of Madrisa Land. This alpine-themed restaurant featured a handy kids corner so our children could play quietly after finishing their lunch. 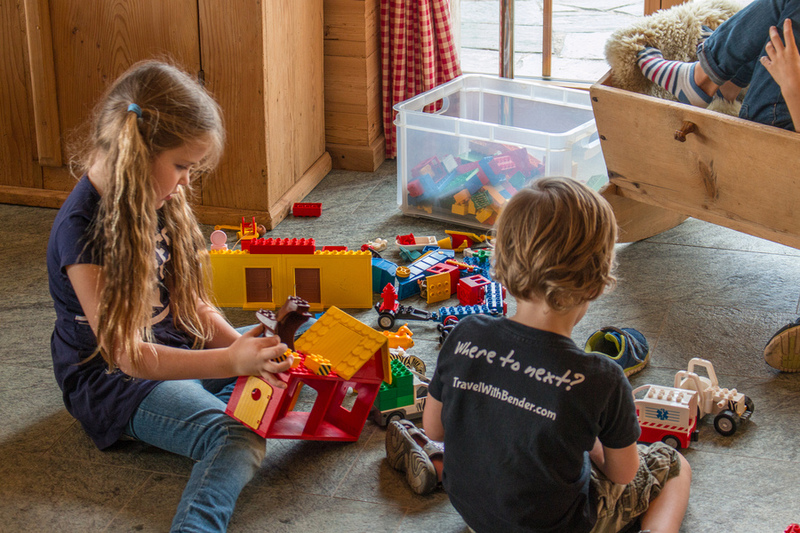 Perfect for parents who needed to catch their breath after a full day of adventure. There you have it. 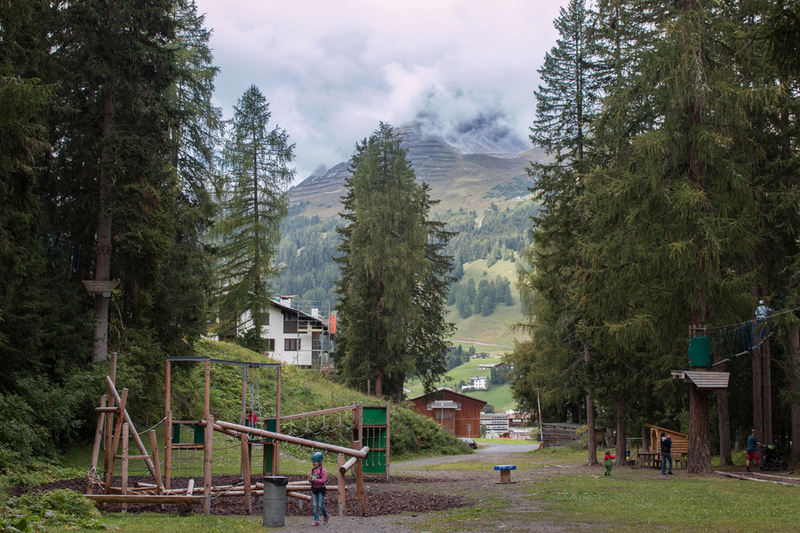 One full day of family summer fun in Davos and Klosters. It’s so much more than just a winter sports haven or a city for significant political gatherings. 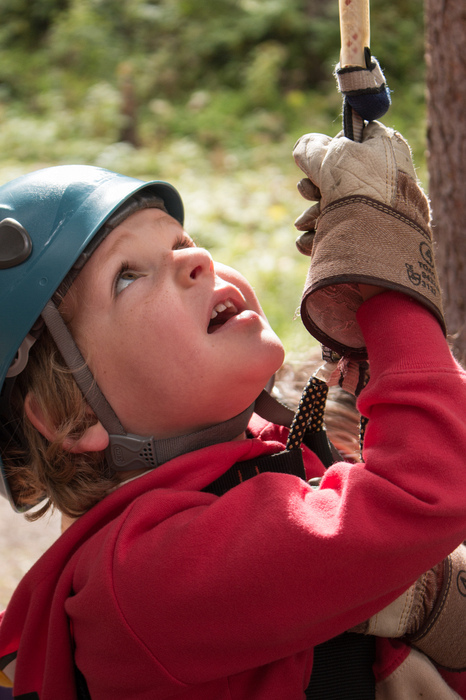 It’s a home for families to indulge and actively pursue the best outdoor activities Europe has to offer.